Why do some people seem to sail gently through all the changes life throws at them, while others get upset if they have to change even their breakfast cereal? The key is in how you view change, and your level of acceptance of uncertainty. There is plenty of evidence that what we find most stressful as human beings is uncertainty, not change in itself. Even the most difficult life events, such as divorce or marital separation, can be more stressful in terms of the uncertainty. Very often, it’s not the event, but the worry about ‘what will I do?’, or ‘how will the children cope?’ that people find hard. 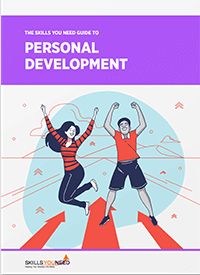 But there are some simple skills that you can develop that will help you to manage change in your own life, whether through work or life events. Our pages on stress management provide more information about understanding stress and stressful life events, but here it is worth repeating that stress is not all in the mind. Stress can cause genuine physical symptoms, including dizziness, tension headaches, diarrhoea and insomnia, which in turn can make you feel worse, and even more stressed. This kind of ‘negative feedback loop’ is common in nature, and is designed to make you stop! Your body is trying to tell you something and, if you don’t listen to it, you could find yourself becoming very ill indeed. Don’t be tempted to ignore the symptoms of stress, and hope that they go away by themselves. They won’t. Instead, you need to deal with the causes. If you are struggling with stress and it's making you unwell you should seek professional help from a counsellor or health-care provider. Stress left unchecked can lead to depression a potentially serious mental illness, learn more on our pages: What is Depression?, Types of Depression and Treatments for Depression. There is plenty of evidence that we all go through more or less the same process when dealing with change, although particular stages may take rather longer in some cases than others. 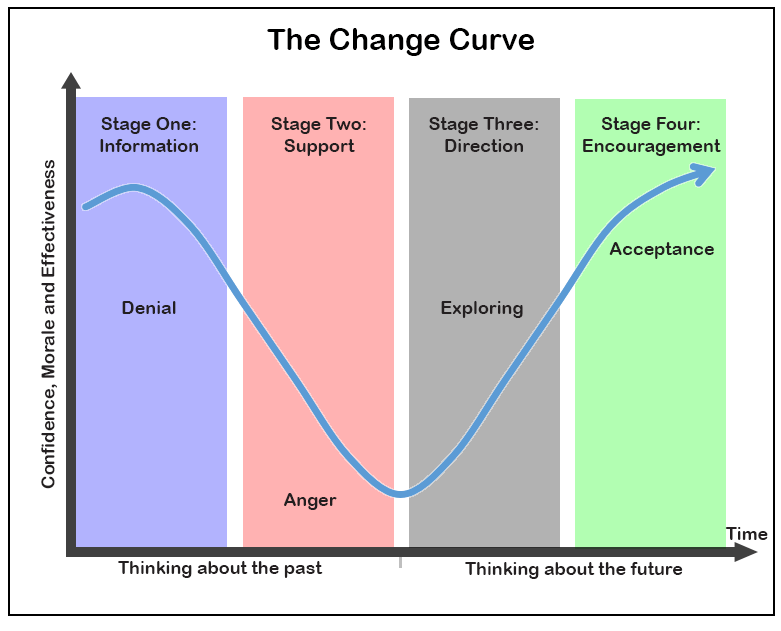 Elizabeth Kubler-Ross looked at the way people come to terms with the news that they have a terminal illness, and developed a model called the Transition or Change Curve. Later studies showed that people react in similar ways to bereavement and also to changes at work. 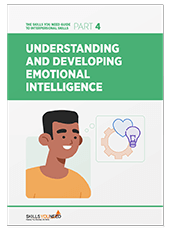 The model shows that people start in a state of denial, with quite high levels of energy and confidence, but that confidence and energy then dip as they feel the need for support, and then become angry, asking questions like ‘Why me?’. They then start to move towards exploration of their condition and new options, and into acceptance. There is more about models and theory of change on our page: Understanding Change. Although it may have become rather hackneyed, this is not an unreasonable approach to managing change in your life. One of the things which those who embrace change generally say that they do is to accept what can’t be changed, and worry only about what they can change themselves. It can be very hard to let go of worrying, but there is no point in getting stressed about things over which you have no control. If the answer is genuinely a resounding ‘No’, then park the issue. Put it to one side, as something that may happen, or not, but over which there is no point in worrying. Then, and this is important, find something else to occupy your mind instead! Realistically, is there anything that I can do to change the likelihood of this event happening, and if so what? Realistically, is there anything that I can do to change the outcome to a more favourable one for me, and if so what? The key word here is realistically: these have to be actions that you can genuinely take to change things, not ‘ideal world’ things like ‘I will get a plumbing qualification within three weeks and be the best student they’ve ever seen’. Before thinking about how you can change the outcome, it is important to think about what your ideal outcome might look like, and how likely that is to happen anyway. Take a look at our pages: Strategic Thinking and Action Planning for more help with thinking through the issues and planning your next steps. The company you work for looks like being taken over by another, and you’re worried that you might lose your job, or that you might end up doing something less interesting. Is there anything that you can realistically do to change the likelihood of the company being taken over? No. Unless you’re the CEO, it’s out of your hands. Stop worrying about it. Is there anything you can realistically do to make a more favourable outcome for you more likely? Yes. Brush up your CV or résumé, get in touch with a recruitment agency specialising in your type of work, and look for another job. You will become more confident as you see the value that others place on your skills, and you will also be more attractive to your existing company if you have another job offer, giving you options. You could also think about what opportunities might open up should you be made redundant, such as the chance to set up your own company, or perhaps take some time off work to travel. This should also make you feel much more positive, and therefore more attractive to potential employers. This is the final element in managing change gracefully. Like good strategic thinkers, those who accept and manage personal change well are those who are clear about what they want. They are quick to decide what they cannot change, and to put it to one side. They are also effective in taking the necessary steps towards change and taking control of those elements that they can change. Once you have made your final decision about what you can and can’t change, and what you are going to do about it, stick to it. Accept your decision and move on. Don’t constantly worry about ‘what if’, as that will undermine all your good work in parking the things that you can’t control. It doesn’t even matter if the reason that you can’t realistically do anything is ‘I have too much else on in my life to have time to deal with this’. It’s fine. Give yourself a break, and accept your own wisdom. Avoiding Stress | What is Depression?